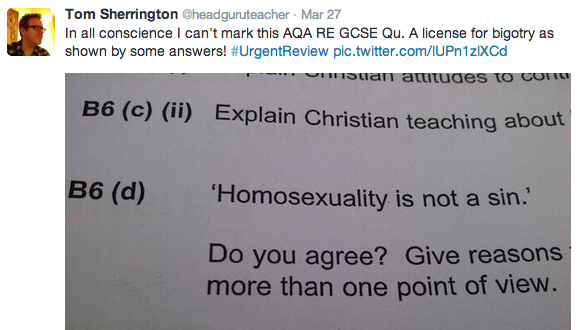 My RE GCSE marking crisis. This was RT’d repeatedly. Towards the end of last week, I experienced a minor crisis during an intense coincidence of events that raised questions about the values we promote in my school and the extent to which we have control over that. At the heart of the issue is our desire to adopt a strong position on equality in relation to sexuality; to tackle homophobic language and promote LGBT rights in a positive and proactive manner. Earlier this term I ran an assembly to raise the issue, as described in this post promoting Stonewall’s superb resources.